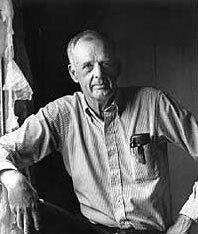 Wendell Berry (born August 5, 1934) is a United States poet, novelist, essayist, philosopher and farmer. His most well known book, The Unsettling of America, provides a classic critique of industrial agriculture which is foundational to today’s agrarianism. Berry was born in Henry County, Kentucky in 1934, the first of four children born to John and Virginia Berry. His father was a tobacco farmer, and as a young man Berry wanted to farm tobacco as well. He attended secondary school at Millersburg Military Institute, and then pursued a B.A. in English at the University of Kentucky at Lexington. In 1957 he completed a Master’s degree in English, also at the University of Kentucky; that same year, he married Tanya Amyx. In 1958 Berry received a Wallace Stegner Fellowship, which he used to study creative writing at Stanford University. In 1960 he and Tanya returned to the 250 acre (1 km²) Berry family farm. After being granted a Guggenheim fellowship, Berry took his family to Europe in 1961. In 1965 he returned to Kentucky, where he taught for several decades at the University of Kentucky. Today he lives and farms on the family farm at Port Royal, Kentucky, alongside the Kentucky River, not far from where it flows into the Ohio. He is a prolific author, with fourteen books of poems, sixteen volumes of essays, and eleven novels and short story collections to his name. His writing is rooted in the notion that one’s work ought to be connected with one’s place. His poetic voice is simple and resonant, a kind of plainsong, usually similar in tone to Jane Kenyon but occasionally veering into the territory of Walt Whitman or Biblical prophets. Much of his nonfiction serves as defense of farming and the connectedness he perceives as inherent in rural life. Do you have any comments, criticism, paraphrasis or analysis of this poem that you feel would assist other visitors in understanding the meaning or the theme of this poem by Wendell Berry better? If accepted, your analysis will be added to this page of American Poems. Together we can build a wealth of information, but it will take some discipline and determination.